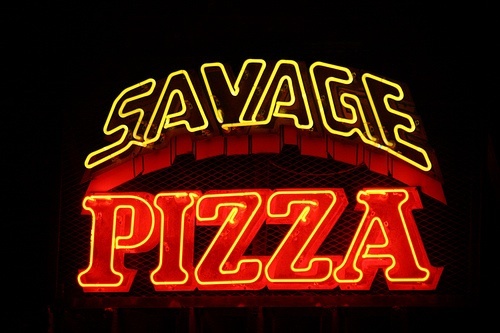 as you approach the front entrance to savage pizza, a large, painted image of a sentinel from x-men hovers over the retro style lettering of the neon yellow sign. they are definitely hitting “the 80’s arcade theme,” something scott thought was pretty cool, even part of the reason he picked the place! comic books line the walls and action figures hang from the ceiling, clear indicators that savage pizza is “very unique” and “doesn’t take themselves too seriously.” i actually really like how hannah put it: “it’s quirky in an it’s-been-like-this-forever way as opposed to trendy, calculated, or try-hard quirkiness. it’s exactly what you would expect from a pizza place in little five.” well said! our waiter, albeit a little on the quirky side, was very sharp and gladly seated our large party at a couple of tables, making space for us to enjoy ourselves. he was attentive and “didn’t seem annoyed at our boisterous table.” thank goodness, considering the folks in this crowd! to start the evening, drew v. and james treated the table to a couple orders of the bread sticks, which were well-received by all. the pizza dough is buttery, “brushed with herbed garlic butter and parmesan” and delightfully complemented by the side of zesty marinara sauce. in jon’s opinion, “good marinara is tough to find and these guys have it.” i think that speaks for itself, don’t you? scott ordered a calzone, and although he is “a big fan of the ‘za,” he was feeling the calzone. although it was delicious, and even if he wouldn’t say he “made the wrong choice per say,” the calzone was just good and standard. and if you think about it, “there just isn’t much room for personal touch in a pocket of dough.” he even admits, “the pizza is where a place like this shines and i really dropped the ball.” there’s always next time! since i can hardly finish one meal in one sitting, i ordered myself a small of the white on white pizza. the small size is “the right size for one person” and will fill you plenty. white pizza is one of my favorites, and i feel it is a nice change-up from your standard slice of pie. this pizza was excellent and quite satisfactory. the ricotta, monterey jack, chevre, parmesan, and mozzarella all blended together tastefully atop the garlic white sauce. i liked that the crust was crispy and not too thin but not too thick. the pizza was so rich, though, that i could not finish my last slice! i sent it home with james to enjoy as leftovers. overall, savage pizza was enjoyed by everyone at our large table. it’s a place where what you see is what you get, good pizza with good service, a welcome thing considering all the other pizza chains that “are rolling out ‘premium’ pies and bragging about their amazing deals and revolutionary revamping of sauces and toppings.” it has a “cool ambience” and “good beer selection,” a great place to “grab a quick bite before going out.” if you are not a little five points kind of person, the crowd may not have been much for you, but don’t let that keep you from indulging your adventurous side and making the trek down there for savage pizza. here’s to you, kate middleton.